Good morning farmgirl! Bear looks like he's saying "come on mom!!' He's got such a cute face! What a great way to start your day. I'd like to make your farm house bread, is the recipe somewhere on the blog? Have a great day!! Gasp!! Oh wow FG, it looks like a painting. This is the first time I have ever felt sorry for Bear! I can almost smell the rich humus from the parties Autumn has hosted in years gone by. (deep sigh) Also smells like contentment. Enjoy your walks Susan. lol; i think its breathtaking!! I'm very thankful to be able to see in color. I could be a dog! The look on LBB's face is great: "C'mon, lady, what's the holdup?" I love that photo of Bear. That's the classic, "Come on, let's get going!" look. 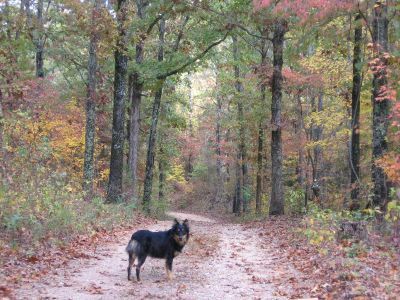 There's nothing like wandering the woods with a good dog. Brings out the inner adverturer in me. WOW! I can't believe you did what we did... we left San Francisco 4 years ago and moved to a very small cottage on 12 acres in Eureka Springs, AR. Wow... I thought we were the only ones. ... a quotation from my dogs diary .. I just walked 2 miles, she just did the same route and walked 8!